← B Gata H Kei episode 2: I make a cameo?!? Although no one can stay dead in this world, there still something very unsettling about watching everyone in the party die one by one. I suppose there’s no way to take away the weight of death completely, especially when people are killed in fairly gruesome ways. Also, what a backstory for Yuri. It’s really sad. I mean, I shouldn’t expect less considering what I’ve heard about Key, but it’s pretty heavy. I wonder now if she’s a girl who really wants to fight the system, or just wants to get back at God. Still, in this episode, she really distanced herself from Haruhi. She’s not self-centered and selfish enough to be Haruhi, but cares about the people around, and is heavily impacted to what happens to them. However, she also has the ability of a leader to do what needs to be done. Although the side characters don’t get that much screentime compared to Yuri, they’re all still managing to really grow on me. Especially TK with his English. TK definitely had a chance to shine this episode. I couldn’t remember who half the other people were, unfortunately. It was good to get Yuri’s backstory. You’re right that, personality-wise she stands out from Haruhi, but every time I see her I am visually reminded of Haruhi. Makes me wonder what went into that artistic decision. I don’t remember their names, but I remember who they’re suppose to be. I’m bad with names. I wonder myself. Maybe it was a coincidence, she looks like in that Visual Novel? This show’s trying really hard to not be serious one minute, and then trying really hard to be serious in the next. I wonder what the heck they’re aiming for.. comedy, tragedy, or just being a spectacle. Playing the traps for laughs and then tacking on a heartfelt backstory somewhat numbed everything and made it seem insincere. If the intent is just to parody everything that is Key, that’s fine.. but it’s just not selling itself to me as anything except an identity-confused spectacle. I never felt like the traps were being played for laughs. While people made comments, or tried to make the best of the situation, as time went on, and more and more people died, the mood got darker. However, they did acknowledge that these people wouldn’t stay dead, and didn’t mourn them. They were just being incharacter, not trying to be silly persae. Some of the characters themselves as just funny people though. Good review, and because it is becoming a peeve of mine, thank you for denouncing the Haruhi comparisons. I hate lazy artwork too, but stop selling this show sort because you can’t get over it. I loved TMOHS but I already respect Yuri’s leadership 1000x more. @Deaky: I feel that maybe some of the humor falls a little flat but the trap segment in its own way served as a subtle character development for the expansive cast we have. I liked the depressing backstory as a motivation for war against the creator but it might have come up a tad early, I would have liked to perhaps come to like Yuri more before I felt so much sympathy that I couldn’t help it. 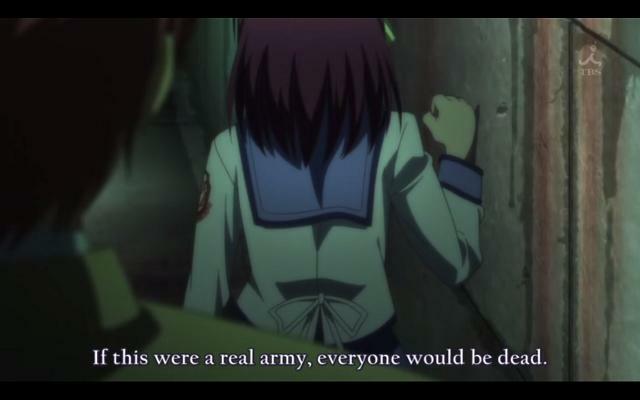 I don’t know if it is fair to call it identity confused yet, while I understand the feeling you have to admit that Angel Beats is trying to present its own very different vision and if we try to pigeonhole it already we might sell it short. Not the anime might still fall flat mind you but so far I have enjoyed the episodes greatly for what they are and I’ll put off that critique till later. Enjoyed the review, hope you will both give me your thoughts and critiques on mine as well.